On September 1, 2015, the University of Utah held a grand opening for the new S.J. Quinney College of Law building. 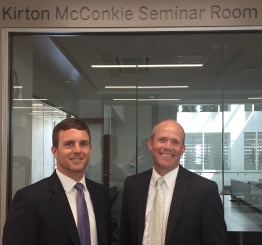 Kirton McConkie was a proud donor to the construction fund along with several firm attorneys. In particular, Kirton McConkie supported the "green" fund for sustainability and energy efficiency features. It is the first law school in the West to be LEED Platinum certified and only the second in the country. The Kirton McConkie name is featured on one of the seminar rooms. Utah Governor Gary Hatch, U.S. Senator Orrin Hatch and other state and community leaders were in attendance.